Silverfish were given their name because their movement resembles a swimming fish. Three long, slender, antennal-like appendages emerging from the rear of their body which is covered with silvery scales. 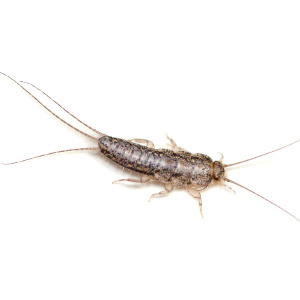 Habits: Silverfish are strongly attracted to the glue on wallpaper, sizing on books, paper and damp cloth. Habitat: Humid environments within homes, garages and storage buildings with temperatures between 71 to 90 degrees F. are favored. Silverfish search from basement to the attic searching for food and, will not leave and will not relocate until that source is exhausted. Threats: No health threats are associated with this pest.